The Deberry Team is excellent to work with. Communications are excellent. My Mum and Dad, brother in law and I have all completed sales and purchases and I will continue to call Roxanne. You guys are the best. "After buying 5 homes you think I would have seen everything when it comes to purchasing a home. I couldn't believe it when I received so many phone calls and emails keeping me informed and asking how my experience was with The DeBerry Team. The DeBerry Team closing coordinator kept me so well informed that I felt extremely comfortable and satisfied with the whole process of buying a home". Continue with what you are doing. Candi was awesome to work with. Ragen was very professional and attentive. He knew the area well and found our home in 2 days!! He always returned calls and was proactive every step of the way. Thank you from my family for the white glove service! A Top Notch Team and seamless process! Up to date technology made it very easy for us. Everything absolutely flowed from the day I called Roxanne to the day I closed the sale! It all went so smoothly! "Very Efficient & A wonderful Team to Work With"
The DeBerry Team is very efficient. They are a wonderful team to work with. Ragen was very educated and informed about the area. It helped a lot as I was on a deadline which I was able to meet with his help. Thank you, Roxanne and Ragen! Our first contact with Roxanne showed her to be professional and highly knowledgeable and is it turns out, her team as well. They made it easy and painless from start to finish, answered all our questions, even the ones we did not know to ask. Candi is a shining example of a really good down to earth and "understanding" realtor. She really does go out of her way to make her clients happy and communicates really well with buyers. Candi even helped me find a realtor is my state to put my current home on the market. I would refer her and the entire team to anyone I know in a heart beat! Moving to the Dallas area has been a dream of mine and Candi has made that dream a reality. I am very thankful for everything Candi has done for me. May many blessings come your way. "I will use the DeBerry Team again, For Sure!" I was a first time seller. The DeBerry team made the whole process easy and understandable. I will use them again for sure. 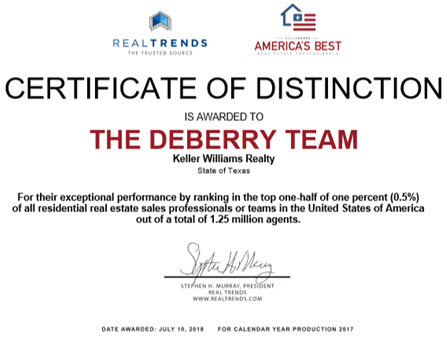 "The DeBerry Team Continues to Impress Us!" This is the second time we used The DeBerry Team. They continue to impress us with their knowledge, professionalism and organisational skills. I never felt rushed or hurried. Ragen had been my agent for well over a year and never gave up on me. Always quick to respond, he took great care and time at every showing. He has become a friend that I can always rely on. If you want a realtor that goes above and beyond the call of duty, Candi White is the one. While going through the home buying experience you need a good team. She was definitely the MVP on my team and made my experience a pleasant one. Her actions and communications were always on point. She is the definition of someone who has your back. Candi, I can't thank you enough. Quin and I are extremely happy with e service and love you have shown us. Candi was my realtor through a build job with DR. Horton and it was complicated to say the least. She was there for us through thick and thin. We were out of town buyers, so not the easiest of customers. We moved from San Antonio and I had numerous health issues during the year that the house was being built. She gladly stepped in and took up the slack when I was just too sick. If you need a caring person who has your best interest at heart, you need Candi White. A real Jewel!. "Did A Great Job Of Guiding Us!" Roxanne did a great job of guiding us through a very difficult foreclosure purchase. Without her experience and knowledge the great opportunity would have been lost. Ragen Jones was extremely patient in what turned out to be a rather lengthy process. He consistently kept our interests in the forefront, was accessible, market knowledgeable, responsive to our concerns and questions throughout the process. We noted his well developed sense of integrity in all matters relative to both the search efforts and final negotiations with the seller. We would recommend him highly to our friends should they be in the market to purchase a home. "I Appreciated The Great Effort And Teamwork!" In a very tough market I appreciated the great effort and teamwork utilized to effectively market my home and find a buyer. It is difficult to allow someone to market your most valuable asset, however your continued communication and updates, even though I was hundreds of miles away, gave me comfort that everything would be taken care of just as if I was there myself to do the job. Thank you so very much for your wonderful efforts, service, and communication through to a successful ending. "I Can't Express Enough Thank Yous!" Without The DeBerry Team I could not have gotten through the process of our selling our home at 3913 Carrizo. There are not enough "thank you's" to express my appreciation to all of you for all that you did. "I Got More Money For My Home Than I Expected"
I gave "The DeBerry Team" all 10's for their performance on getting my home sold. From listing to closing took less than 45 days and I got more money for my home than I expected. In our opinion, your marketing tools and knowledge of the industry are the best in the business. "No One Does It Better!" "This was the most organized team of professionals I have ever worked with as a contractor, as a seller and as a buyer". "We had a Very Positive Buying Experience with Kathryn"
Thanks so much for the 2016 calendar and the contribution to the Sunshine Kids. We had a very positive buying experience with Kathryn and your office and hope to be able to recommend your group to someone in the near future. "Our Experience Buying Our First Home Was Great"
Our experience buying our first home was great! We looked only at houses that met our requirements and worked with a full team of people. The realtor, lender, and title company made a flawless quick close. The DeBerry Team buyers agent helped us find our dream home and got us moved in in less than a month. "Roxanne And Her Team Were Great!" I was very satisfied. I have referred your team to 4 others since selling my home. Roxanne is excellent! The Buyer Specialist listened to everything we had hoped to see in buying our first home and found us exactly what we wanted. The communication was excellent throughout the whole process. The DeBerry Team was very helpful and was efficient in answering all of our questions and concerns. "Thanks For The Wonderful Job You Did"
Thank you Roxanne for the wonderful job you and your team did in selling our home. You were always there to help guide us through every decision. Selling a home can be frustrating and stressful but with The DeBerry Team at our side we sailed through! Again, our thanks for everything and we will continue to tell our friends about you because "we believe you're the best." "Thanks So Much For All Your Help"
Thank you so much for all your help with resolving our issues with the builder! It was great to have someone working on our side and "going to bat" for us! Thanks again! "Thanks To The Entire DeBerry Team"
Personable, hard working, never gave, thinks outside the box, has numerous resources to draw upon - cares. Thanks to the entire DeBerry Team for the many hours of work on our behalf! I had listed my house with another realtor and got little traffic. I listed with "The DeBerry Team" and got over 5 times the traffic in just one week! If you want to sell your house and be confident that you are getting the best price, call Roxanne today!! "The DeBerry Team Made It Happen!!" We so love the house that you sold to us. Thus when my son was seeking a house, I contacted you. You are the absolute "best" in the world of real estate. You assigned your buyer's agent to assist my son with his purchase. She found him the home even before he saw it. It blows me away how you have nurtured your staff to be just as you are: knowing, caring, and right on! Thank you, Roxanne for helping complete the next step of my son's life. He is the most important to me; I recommended you and you have never let us down. "The DeBerry Team Understood Our Needs"
The DeBerry Team was very patient and knowledgeable in the areas we were interested in. We were very picky and they took the time to understand our needs. Their internal staff was very helpful by being prompt with answers and doing reseach for us which in the end saved us over two thousand dollars! Roxanne and her team have the best knowledge and experience when it comes to selling real estate. "There was Always Someone There to Help Us!" It was truly a team effort. There was always someone there to help us through what can be a very stressful time. "We Highly Recommend TheDeBerry Team"
We were pleased with Roxanne and her team. Everyone made the sale of our home very stress-free and it was done in a professional and courteous manner. We highly recommend Roxanne DeBerry and The DeBerry Team. "We Highly Recommend This Realty Team!" Our realtor was Roxanne DeBerry and her buyer's agent was very professional and helpful in finding our new home. He was there when we needed him and he accommodated us in everyway possible. We would highly recommend this realty team to others we know in the future. "We Love Our New Home"
Roxanne, as always, you have made the selling and buying process a pleasure. For us this can be a stressful process at times. Your team eliminated most of the stress. We love our new home! Buying and selling a home is a difficult process. Your team made it as easy as possible. There was always someone available to answer questions. The communication was efficient and there when it was needed. I can't imagine a smoother transition. What a great experience! "You Gave Us The Right Price To Get Our Home Sold! You picked the right price for the house to sell quickly and you let us know exactly how to prepare our home for sale. A special personal thanks for your help and support. You have a great team! A team is definitely what it takes to sell and purchase a home. From listing updates, feedback, communication and action plans for sale, and all the way to the sales contract, your team expressed confidence in reaching the final goal. This team ranks top in overall team approach. I can't think of anything to improve on. Thanks for all of your help, concerns, and patience with us when we seemed to have lost it! We made it! You did it! You're wonderful!! Please relay to the team our appreciation! "Your Staff Was Very Helpful"
"After the sale of our house you followed up on matters in a very professional way. Your staff was very helpful and always returned my phone calls, which is very rarely done in today's workforce." "The DeBerry Team Exceeded My Expections!" " Everything was handled in such a professional way. I was given all the information from the very beginning as to how the process would move forward. I was kept in the loop regularly and all my questions or concerns were answered in a timely manner. I can’t think of any area of improvement as this is a very knowledgeable team! I simply can’t say enough about Roxanne and the entire DeBerry Team except you exceeded my expectations above and beyond. YOU ARE THE BEST! Thank you for everything". "The DeBerry Team Made the Impossible Happen"
"Keep up the good work! The DeBerry team made the impossible happen. Thank you for your patience and support – specifically to Katherine who went out of her way for us". "Katherine went above and beyond! This is a very professional team effort and I am very satisfied". "The DeBerry Team Relieved All of Our Stress"
"Thank you for taking such a huge amount of stress off of us"! 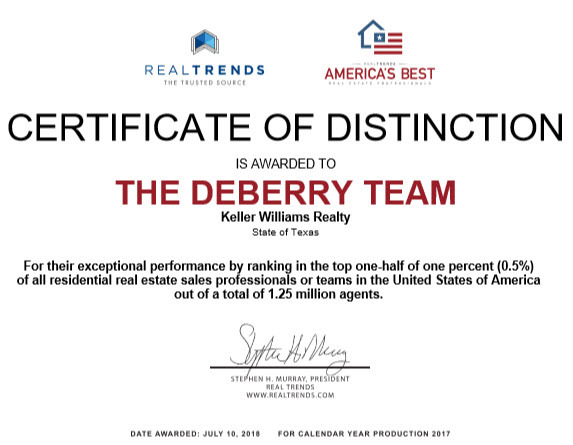 "The DeBerry Team is PERFECT!" "The whole process was fast. The entire team was awesome! I think the De Berry team is PERFECT! I would definitely recommend them to anyone buying or selling a home"! "I Can’t Say Enough About the De Berry Team’s Knowledge, Dedication and Commitment"
"I can’t say enough about the De Berry Team’s knowledge, dedication and commitment to accomplish the end results. It was great working with Roxanne, Ragen and Leslie again. Hopefully there will be one more time"!